Mumbai: Investors are better off selling shares alloted to them in an initial public offering (IPO) on the day of listing rather than retaining them for a longer period, a Mint analysis shows. A study of IPOs launched over the past decade, excluding those that are yet to complete a year since listing, showed that in the case of 198 of 292 companies, or nearly 68% of the companies that listed, the shares did better on their listing day when compared with the returns given over a one-year period. For 71 of these 198 companies, the stock closed lower on the listing day and fell further in the next one year. The trend suggests that many promoters tend to price their public issues in a way that leaves little on the table for long-term investors. In contrast, traders and short-term investors are rewarded because the initial hype around a new listing can lead to a short-term bounce. To be sure, there are other factors such as relative performance of the markets at large, sectoral developments and company-specific events that come into play over a longer period and have a bearing on the stock’s performance as well. “Investing in IPOs during a bull period is a profitable opportunity. Such IPOs typically get hugely oversubscribed and the unfulfilled demand for their shares, coupled with rising markets, leads to higher price on listing date, which makes it the best time to cash out. If you hold on, you may or may not see the same gains again," said Prithvi Haldea, founder and chairman of Prime Database, a primary market tracker. “An investor has to decide whether he is investing in an IPO or in a company. If the former, he need not study the fundamentals and should definitely exit on listing. However, if he is investing in a company, he should research well and stay invested in the company even beyond the listing date," added Haldea. Eighty-nine of the companies analysed had eroded more than 50% of their offer price in the first year of listing. 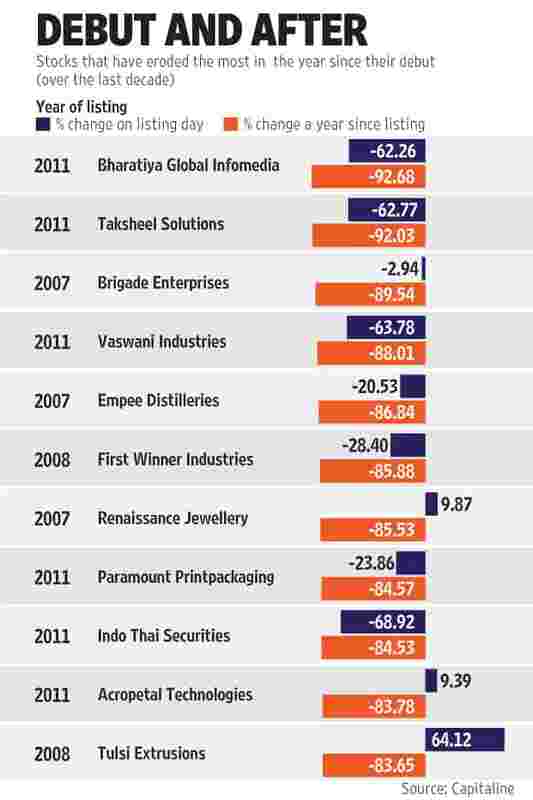 The stocks that fell the most were Bharatiya Global Infomedia Ltd and Taksheel Solutions Ltd, both of which were listed in 2011. These stocks tumbled 93% and 92% in the first year after their debut. “I would say that initially there is a sort of lack of allocation, and people who have missed out rush to buy as there is also a hype around it. However, later demand starts fading out, and price adjusts accordingly," said Dhananjay Sinha, head of research at Emkay Global Financial Services Ltd.
“Price is definitely one of the key issues. There has to be some amount left for the investors. The trader usually exits on day one, and unfortunately in some cases, when investor holds it for a longer period like a year, he or she tends to lose," said Sinha. Raamdeo Agrawal, joint managing director of Motilal Oswal Financial Services Ltd, said that the optimism at the time of listing doesn’t always translate into reality. “An IPO usually happens when a company is in the pink of health... On the day of listing, you end up paying the price, discounting the performance for next one year, as there is a lot of communication from the company, analysts and bankers on the IPO. In the case of good companies, this optimism drives up the stocks," said Agrawal, adding that stocks tend to correct over a longer period of time, particularly if the initial valuation at which shares are sold is on the higher side. The market trend is also an important factor, said Agrawal. According to Sinha, an investor is better off buying the stock from the secondary market once the initial hype has died down, rather than participating in the primary issue. “It makes sense for them to get into the stock after the initial euphoria is over," adds Sinha. Not all stocks have followed this trend. Stocks of around 37 companies more than doubled from their offer price within one year of listing. Among these is electronics maker MIC Electronics Ltd, whose shares rose almost fivefold in their first year of listing. The top 20 stocks that more than doubled in the first year also include companies such as Info Edge (India) Ltd, DCB Bank Ltd, Tech Mahindra Ltd, Jubilant Foodworks Ltd and GMR Infrastructure Ltd. While analysts say that aggressive pricing is one reason that IPO stocks perform better over a shorter period of time, investment bankers don’t agree. “When companies go public, anywhere between 5% and 20% money is left on the table for investors. There would be some cases, though, where this would be absent," said Vikas Khemani, CEO, wholesale capital markets, Edelweiss Financial Services Ltd.
“For analysing, one-year return of a stock, one needs to look at relative returns of the sector, and the peer set. There are a lot of factors such as the relative market performance, which are key to the performance of the newly listed stock too," added Khemani. Concerns over aggressive pricing have also been expressed by regulator Securities and Exchange Board of India and this has pushed bankers to price primary issues less aggressively. This could swing the balance between short-term gains and long-term performance in the case of more recent IPOs. Of the 24 companies that hit the market with an IPO over the past year, 12, or 50%, had listing-day gains which were better than their performance from listing till date. “If you look at the last one year, it was not a great one for the market," said Sinha of Emkay, pointing to the fact that the Sensex has shed 11.8% in the last one year. “Due to this environment, the pricing was also a lot more realistic, to attract enough investors," Sinha added.